Simon & Schuster sent me an egalley of this book to read for review (thank you). It will be published the first of September, so put it on your TBR list and check with your local bookstore to get a copy. Sky has a special purpose in life, but no one has told him what it is. All the people around him are just working hard to keep him alive. The part I enjoyed the most was when he met up with some cool characters who were his age, in his classes at school, and who were trying to kill the monsters that were stealing children. Sky has read enough and learned enough to know that all strange beings are not necessarily mean. They may look like monsters and they may be dangerous if cornered, but some have no interest in humans. His friends tell him he's wrong, so he has to determine what's happening on his own. I was amazed to find that the author envisioned his characters as based on fairy tale characters. I sure didn't see the similarities. Here's a quote from author's background on this story: "To flesh out the characters, I thought long and hard and decided to base each of the core monster hunters—Sky, Crystal, T-Bone, Hands, and Andrew—on a fairy tale so that I could work in specific themes. Sky was Hansel and Gretel following breadcrumbs. Crystal was Pinocchio, a broken girl full of lies, struggling to become real. T-Bone’s family came from the nursery rhyme “There was an old woman who lived in a shoe.” Hands, like Little Red Riding Hood, visited his grandpa at the old folks home on Riding and First, a home “run by wolves.” And finally, Cinderella inspired Andrew, as is most apparent in his two wicked stepsisters who speak like characters from a Jane Austen novel (Is there anything more wicked than this?). Many of these fairy tale origins slipped into the background as I developed the characters, but you can still see them if you look closely. 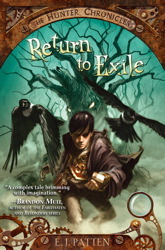 Return to Exile is filled with hidden things." There are many hidden things in this story. And Sky's adventure may have ended for the moment, but it's not done by a long shot. Why not get a copy of this book and memorize it and see how many things you discover as you re-read it again and again? Then you'll be ready for the author's sequel, should he write one. If not, write one of your own! I hadn't seen the bit about Patten using fairytales to flesh out his characters. Now that he's stated it I can see the similarities, but I never would have guessed. I enjoyed your review and included a link to it in my own review post of this book.